← How Is the Christian Transformed into Christ’s Image? These are the only viable choices. I do not believe there has ever been a time—even in the days prior to the Civil War—that we as Americans have gone to the polls with greater issues than those at stake in the coming presidential election… I am convinced that the direction we take from this point on will determine not only the ultimate fate of our nation, but also the fate of the entire democratic world as we know it today… I think it is the duty of every individual Christian at election time to study the issues and candidates and then go to the polls and vote. Since your vote in this election is so critical, I thought it would be good to give you my thoughts (according to my research and observation) on how to decide on who to vote for. Here are three points to consider. 1. Do not vote according to your conscience or how you personally feel about a candidate. God has given us a conscience to help us make decisions, but unfortunately, our conscience is not always our best guide. Our conscience may be flawed. This is the same with our feelings. They can’t be depended on. We must make decisions based on study and sound judgment. 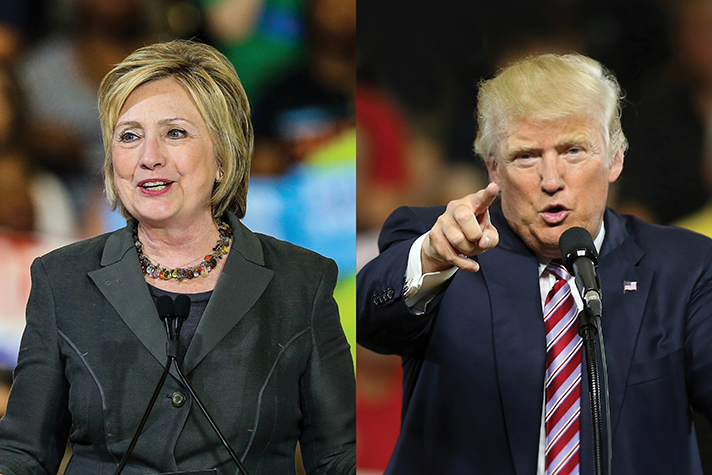 Yes, you should study to get to know where the candidates stand on the issues. It would also be good to study their background and character to determine how they would lead the country. But my caution is to evaluate the whole person and their works, not a few particular flaws. Remember, we are all flawed—sinful. My point here is that we should take a fair look at both candidates and not let our feelings lead us. We should also try to sense how God may or may not use a candidate to lead this country, regardless of his or her flaws. Try to get a sense of what God may be doing. 2. Vote according to the stance they take on the important issues. There has never been a time in our history where there has been such a great divide on the issues as now. According to how you vote will determine what kind of America we have. Probably the three greatest issues are: 1) Religious liberty, 2) National security, and 3) the view of our Constitution and the Supreme Court Justices. Democratic platform: Favors the belief that decreased military spending is necessary. Hilary Clinton and the Democratic Party: Has a belief that the Constitution is a “living, breathing document” that bends with the times and with evolving moral standards. Clinton told the Washington Times: “I would not appoint [Justices] who didn’t think Roe v. Wade is settled law.” She would strive to appoint justices in the mold of Justice Sonia Sotomayor. Donald Trump and the Republican Party: Has a belief that the Constitution is an enduring document for the nation, with timeless guiding principles for civil government. Trump has praised the late Antonia Scalia as a model Justice. Trump released a list of 20 potential Justices which he said are on the order of Scalia. IMMIGRATION is also an important issue. Hilary wants to let in many more immigrants with open borders. Trump wants to build a wall along our southern border and will carefully vet anyone whom we let in – “extreme vetting.” I like this idea! We can’t have a country where we let in people who don’t want to live according to our laws. 3. Vote based on past performance and what we know of the candidate and how we believe they would lead the country. Donald Trump. As we know Trump is a very rich and successful business man. He also seems to know how to negotiate trade deals, etc. And he seems to have a very nice family. On the negative side, as we have seen recently from an 11-year old video, he has some moral issues, which some are very shocked by. This is a concern, but I don’t think it is a big enough issue to disqualify him from the Presidency—my opinion. And what about the way he talks—his temperament? Is that an issues? You decide. And is he prejudice or bigoted as some think? Many think not. Many women who work for him love him. They think he is a gentlemen. According to what I have heard about her history as Secretary of State, what she did was far more damaging for the country than productive. I could probably unload tons of negative things about Hilary, and both of the Clintons, but I think it would be better if I didn’t. After all, anything I say is just what I hear and read. Generally speaking, I think she and her husband are just plain corrupt—with layers and layers of corruption. Newt Gingrich has said that Hilary is the most corrupt candidate that has ever run for the office of President. Now prepare and plan to vote for one of the two candidates—Clinton or Trump. The future of this country and the world is a stake! This entry was posted in Making Ourselves Ready and tagged Billy Graham, Donald Trump, Hilary Clinton, how to vote, immigration, National security, presidencial candidates, religious liberty, supreme court justices, the U. S. Constitution. Bookmark the permalink. This is a very important election coming up. Each of us needs to pray for his or her candidate choice. And pray also for people to get out and vote–and for God to lead us in who to vote for.